Outstanding Crochet: Nice surprise for my birthday - to be selected as First-Place winner in the Crochet 2016 Calendar Pattern Contest. Nice surprise for my birthday - to be selected as First-Place winner in the Crochet 2016 Calendar Pattern Contest. The top is embellished with a lace at the neck line. This wouldn't happen without a help from my friend and crochet mentor - Mary Jane Hall, who gave me an idea to participate. 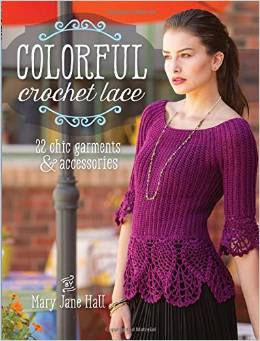 Please, check out her crochet pattern books at Amazon store. LOVE the lines in this top...I will have to check out Mary Jane's book. Наташа, поздравляю с успехом!. Очень красивая разлетаечка. Natalia, I am SO SO excited that you won the contest! You deserve it and your top is beautiful! One of my favorite colors. I'll be sure and get the calender. And I want to thank you also for promoting me and my books. You are such a good and sweet friend! Thank you! It's no surprise to us! You're brilliant! :) Congratulations, you totally deserve it. Well deserved, what a wonderful design. I love the colour too! Sounds like your birthday was a celebration for more than one reason!